This time of year inspires many great lists of names inspired by Christmas and the festive season. And while the way Christmas is celebrated has many similarities across different (particularly Christian) countries, there are some very big differences between Australia and many other countries. By which I mean it is Summer here at Christmastime. So while we also celebrate with carols, bells, light and Christmas Trees, names like Winter and Snow have no relevance to an Australian Christmas. We're not sitting by the fireplace drinking hot cocoa - we're more likely to be in the backyard cooking a barbeque. With this in mind, I thought I'd compile a list of Christmas related names specifically for Australians. Let me know if there are any you'd add! As mentioned above, most Australians use their barbeque a lot in summer - I know people who would happily cook all three meals of the day on it. But we rarely call it a barbecue. We like to call it a barby or barbie. It may feel a little dated or too plastic doll for you, but Barbie would be a great homage to Australian summers. It's not unusual for Christmas day to be hot - really hot. 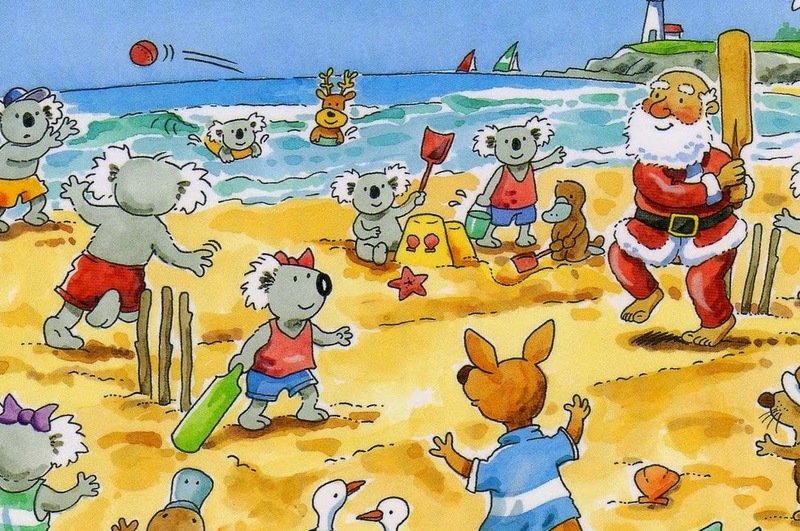 So if you live by the coast, many people escape to the beach for a swim on Christmas day. It feels cruisy and relaxed - a possible sibling to Bodhi. It's hard to imagine an Aussie Christmas table without cherries. They're in season, fresh and delicious. Not to mention that their bright red colour looks great on the table. If Cherry feels a little 80's (or let's face it, a little too stripper) for you, how about one of her international versions? Cereza or Cerise are both gorgeous options. I'm not sure about other countries, but Australians love their slang. Similar to Barbie, Chrissie is a common term for Christmas here in Australia, with common uses being "Chrissie Day", "Chrissie lunch", or the question "what are you doing for Chrissie?" She's a little more youthful than Christie, but still sweet and perky. Cricket may be all insect to Americans, but to Australians (and many other countries) it's the ultimate Summer sport. After Christmas lunch, families all over Australia will get together for a friendly game of cricket, whether it's in the backyard or on the beach. And of course being summer, there are plenty of the insect variety available too. It's a name that will bring to mind long summer nights and fun with the family. where it's pretty much a sensory overload of beautiful colour - everywhere. It's snowing jacarandas in my street. There's mangoes and watermelon, blueberries. All that colour." Jacaranda flowers are blue to purple, and in rare cases white. it makes a for a lovely floral name - unusual yet not jarring when considered next to names such as Miranda or Jacinda. If you've lived in or near Adelaide in South Australia, chances are you've made at least one Christmas pilgrimage to the town of Lobethal. Nestled in the Adelaide Hills, Lobethal (German for 'valley of praise') comes alive at Christmas time, and the line of cars starts for kilometers outside the town in the evenings leading to Christmas Day. The main attractions are the light displays, but there's also pageants, Christmas Tree competitions and a living Nativity. We love Christmas Carols, and Carols by Candlelight is a popular event. Many councils and local areas have their own, but the two main televised events are the Sydney Carols in the Domain and the Melbourne Vision Australia Carols by Candlelight. One of my favourite performers has to be Marina Prior. A famous theatre performer in Australia, she's performed at the Carols for over 20 years and is a beautiful and classy person - a great Christmas inspiration. Myer may be a department store here in Australia, but the name is very closely linked to Christmas. From gift shopping, to Christmas Eve carols at the Myer Music Bowl, to the must see Myer Christmas window displays in Bourke Street Mall in Melbourne, the name Myer is associated with many happy Christmas memories. Particularly for Melburnians. Our Christmas dinners are just as likely (and possibly more so) to include fresh seafood as it does the traditional roast. The craziness at the fish markets on the days leading up to Christmas are a testament to that. Prawns and Crayfish are the main favourites, but who wants to name their children Prawn or Crayfish. So how about Ocean? It's fresh, calming and a great summer holiday name. The inclusion of Summer is a no-brainer. She may not be as fresh as Winter, but Summer has become a modern classic. Just the word is infused with warmth, bringing to mind relaxed, fun days. As a name Summer is somewhat preppy, somewhat hippy - a great easy-to-wear crowd pleaser of a name. Because Summer is all about the sun. Half the country even has daylight savings so we can make the most of the summer sun in the evenings too! For example, here in Melbourne today first light was at 5.24am and last light will be at 9.14pm. The name Sunny captures the enthusiasm and cheer we feel at this time of the year - it's full of optimism and positivity.